Star Realms Launching on Steam in 2016! 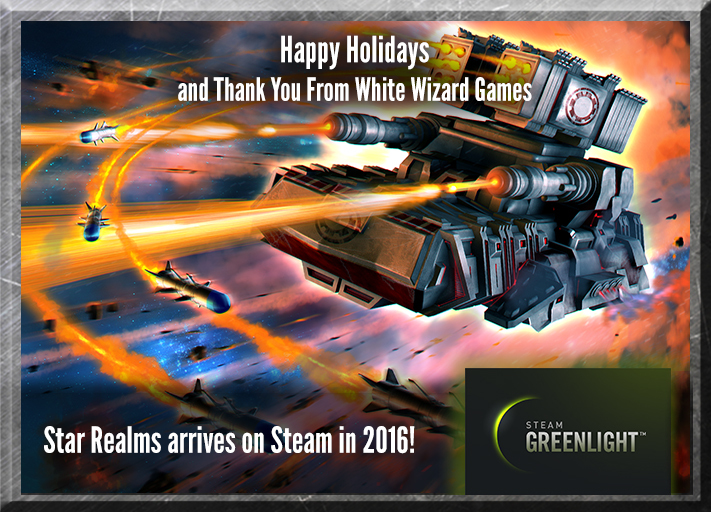 We received a great holiday present from our Star Realms fans — today Star Realms has been “greenlit” by Valve for launch as part of Steam in 2016! This would not have been possible without the support of so many of you clicking over to Steam Greenlight and voting us up. We do not yet have answers about most things about our launch on Steam, and won’t until after the holidays — but rest assured that any purchase of Star Realms on any platform applies to all platforms, including Steam. If you have purchased Star Realms on iOS, Android, PC, or Mac — thank you! You will not need to purchase the app again to be able to access it through Steam. From all of us at White Wizard Games — thank you so much for helping to make this happen, and happy holidays! I run a dual-screen setup, and it launches on what the hardware thinks is the primary monitor, but what I’ve set in Windows as the secondary. Oh, and the “hardware primary” is in portrait orientation to boot. So Star Realms is pretty much unplayable on it. How do I get it to launch on my secondary monitor? Superhot added something similar the first week they were out, so I know it’s possible (plus every other game seems to start on the secondary). Thanks!